You might think that every marathon is the same. Same race, just different place. I can tell you from my experience that they are not. This past weekend I ran my twelfth marathon, the Virgin Money London Marathon. It was very different than any other I have run. Someone said the London Marathon is “so much more than a race.” Truer words have never been spoken. This was a special year for the race. The London Marathon started in 1981 with a mere 7,000 or so runners. This year over 39,000 runners were entered. At some point during the race, the one-millionth runner was going to cross the finish line. To generate excitement before the race, the organizers started the #oneinamillion campaign about this remarkable milestone. As of today, they are still trying to determine who the one-millionth runner was. I might not be that one-millionth runner but I am hoping I crossed the finish line before them. 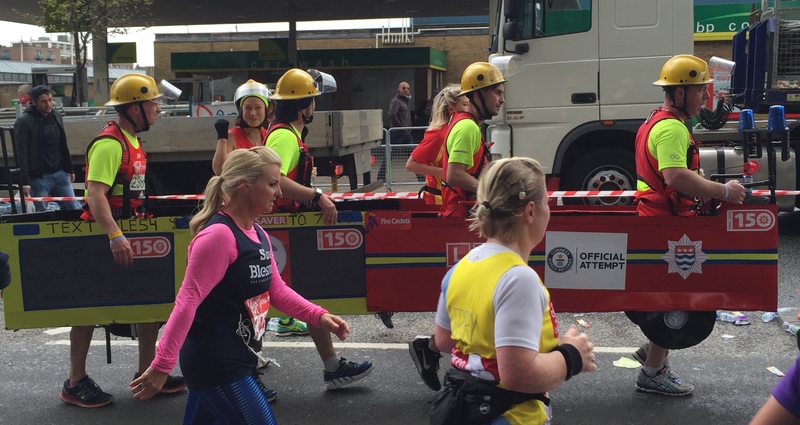 There are runners who have completed every London Marathon since it started. They call them “Ever Presents”. They started tracking the Ever Presents in 1995 when there were 42. This year the number of Ever Presents was down to 12, all male runners between the ages of 57 and 79. I can’t imagine running the same race for 36 years in a row. I have to take my hat off to these gentlemen. They are committed. The race among the elite runners was full of excitement. The overall male winner, Eliud Kipchoge, finished in 2:03:05 – the fastest London Marathon finish and the second fastest men’s marathon record – only 8 seconds off the current world record of 2:02:57. The overall female winner, Jemima Sumgong, fell at Mile 21 when another runner clipped her heels. She went down hard, striking her head on the pavement. But she got back up and kept going despite a gash on her head. Jemima worked her way back into the lead and finished in 2:22:58. In a four-person costume achieved by four real life firemen who ran wearing a fire engine. They completed the race in 5:25:02. By a man wearing chainmail in 5:45:51. Wearing a full body dinosaur costume (man) in 3:08:34. Dressed as a plant (a man dressed as a forget me not in a flower pot) in 3:02:43. This runner also is the current record holder for the fastest marathon in a wedding dress. Dressed as an organ (prostate) in 3:13:20. Dressed as a bottle (in this case, a bottle of Wimbledon Brewery beer) in 3:09:37. Dressed as a crustacean (a lobster) in 3:17:57. My biggest fear realized – I was beaten by a guy dressed as a lobster. Dressed as a fast food item (hotdog) in 3:57:17. A woman dressed in a full-body animal costume (polar bear) in 4:22:08. Two person costume (horse and jockey) in 4:21:21. 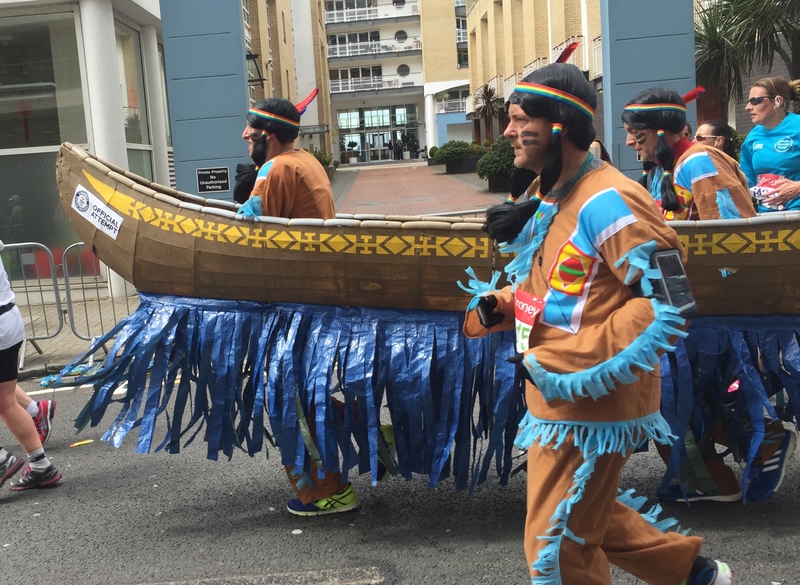 They must have beaten the two runners I saw dressed as Native Americans wearing a canoe. Major Tim Peake, a British astronaut ran the fastest marathon in orbit by running the marathon on a treadmill in the International Space Station while we ran through London. As he ran, Tim watched a video of the route on his iPad. He had to use a harness to keep himself on the treadmill while he ran. Tim finished his “London Marathon” in 3:35:21, only 16 minutes slower than his time running the 1999 London Marathon. If there is a record for someone running the same race on Earth and in space, he should get that one too. While Tim ran in orbit, Martin Hewlett ran in London and set the record for the fastest marathon dressed as an astronaut in 3:06:26. One of the most amazing records is the one set by three men for fastest four-legged marathon. They finished in 4:44:19. I can’t imagine the amount of coordination that it took to keep them all in synch for 26.2 miles, especially for the runner in the middle who had each of his legs tied to one of the other runners. I was most impressed by the number of charity runners. The London Marathon had more charity runners than any other race I ever have run. Approximately 3/4 of the runners were raising money for one of the over 80 charities associated with the race. For the “have-a-go” runners (as one newspaper referred to first time marathoners), entry through a charity guaranteed them a spot in a very popular race plus a way to support a cause that was important to them. By raising money for a charity, they have a way to honor a loved one who was lost to cancer or a stroke, or show support for a family member or friend suffering from diseases like Colitis or mental illness, or help raise awareness about various social causes. They become someone’s hero. Not surprising that the world record for fundraising through a marathon was set at the 2011 London Marathon by Steve Chalke who raised £2.32 million (nearly $3.4 million by today’s exchange rates). Many of the charity runners wear costumes to help raise money for their cause. I saw runners dressed as Star Wars Storm Troopers, Paddington Bear, Sponge Bob, film and book characters, full body dinosaur costumes, an old fashioned desk telephone. As I passed a man dressed as a toilet (who was running for water.org), I teased him by saying I disliked when a toilet runs. He laughed and replied that he would be flush when he finished. 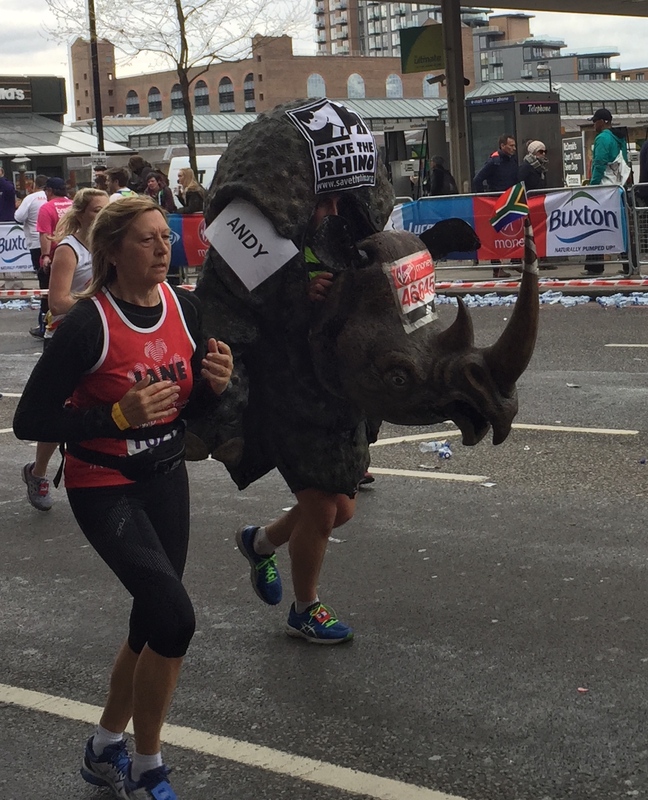 There was a large number of runners dressed as rhinoceros (for Save the Rhino). Shortly after the race, I learned that a runner had collapsed at Mile 23. It was David Seath, a 31 year old Green Beret in the British Army who was running for Help for Heroes, a charity that provides support to wounded service members. He had set a modest fund raising goal of £250 ($365). He died later at a hospital. News of his death shocked everyone and his fundraising web site was flooded with donations. As of today, people have donated over £69,500 ($101,000). One of David’s friends created another fundraising web site in his memory also to benefit Help the Heroes. That web site has raised over £93,000 ($135,813). Between the two fundraising web sites, over £162,500 ($236,00) has been raised for Help for Heroes – all because of David. From such a terrible tragedy came more money than David could ever have imagined raising to help an organization that was important to him. Of all the races I have done, the London Marathon is right up there at the top of the list. It is a celebration, a chance for runners to test their limits and possibly set new world records, and an opportunity to be heroes to the charitable organizations many of them were supporting. Yes, it was much more than just another marathon. Although I am running faster these days, I ended up finishing about 15 minutes behind my personal record (PR) for the marathon. My husband was disappointed that I didn’t push myself more and go for a PR. But I had decided before the start that this race was special, one that I needed to savor. Along the course, I took time to stop and take pictures, to capture some of the excitement. As I neared the finish line, I didn’t want the race to end. I paused for a few moments between Miles 25 and 26 to look around and soak it all in. It was a fabulous race. I was one in a million. Here is a link to the press release listing all of the new Guinness World Records set at the 2016 London Marathon. 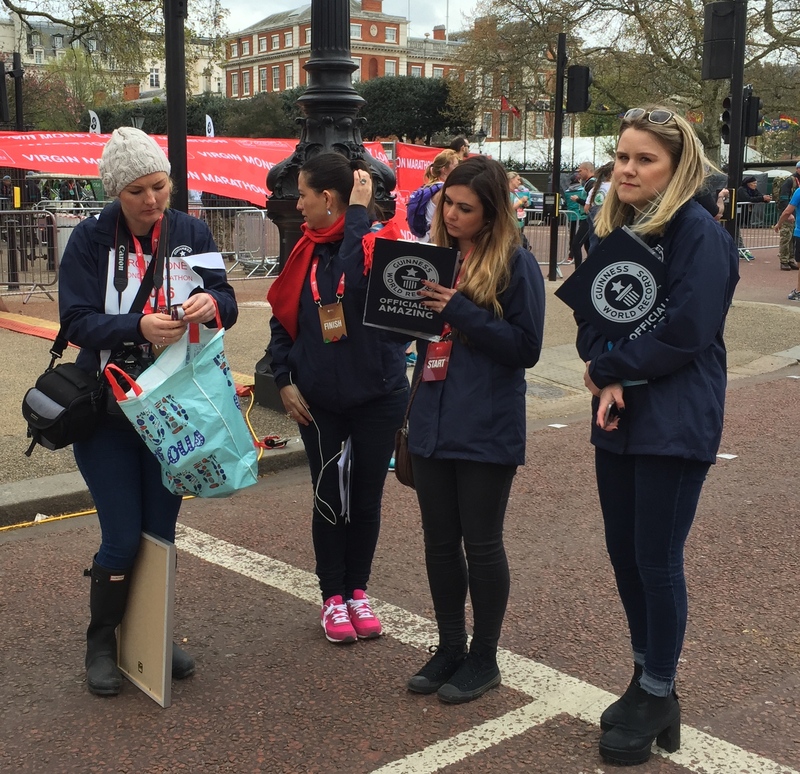 Do you want to run the London Marathon? Travel partners like Marathon Tours can get you in the race. I have travelled to several races with this company and I have never been disappointed in them. They know the races, provide the most convenient accommodations, and help ensure you have a pleasant running vacation. Check them out! David Seath is a hero.